The Metropolitan Transportation Agency (MTA) has released the first-ever regional transportation map designed for the upcoming Super Bowl XLVIII game. The regional map, which is available to download in PDF form, was designed by Yoshiki Waterhouse of the Vignelli Associates design studio. 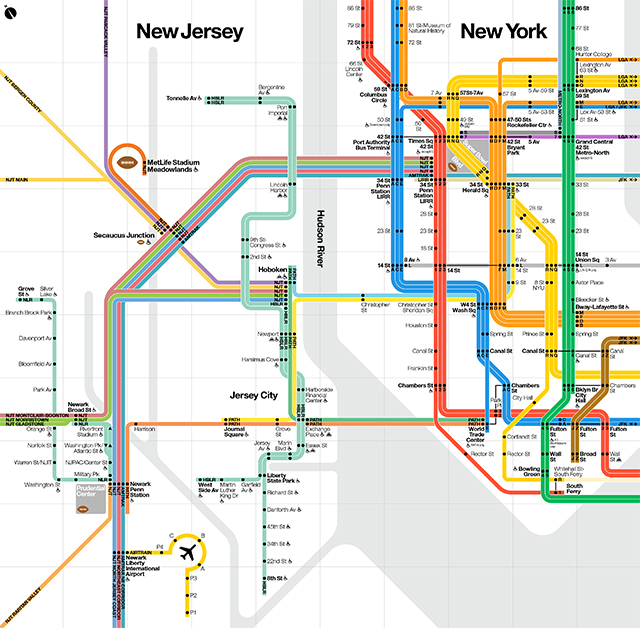 The style of this massive diagram is based on the famous New York City subway map designed by Massimo Vignelli in 1972. The regional transit map lays out all of the New York and New Jersey transit services including New Jersey Transit, AirTrain JFK, PATH trains, Long Island Railroad, and the New York City Subway. Super Bowl XLVIII will be held at MetLife Stadium at the Meadowlands Sports Complex in East Rutherford, New Jersey on February 2nd, 2014. The diagram shows all interconnections between the regional transit services, and highlights with a football icon those areas where Super Bowl-related events will occur on both sides of the Hudson River. The diagram will appear on all transit provider web sites, as well as in Super Bowl web sites, guides, publications, mobile apps, and folding pocket maps to be distributed by the Host Committee. More than 400,000 visitors are expected to the region for game-related events, and about 80,000 will attend the game on Sunday, February 2nd. With public transportation serving a critical function during Super Bowl week, each involved transportation agency will play a role.